An official from Russia’s Military Industrial Commission has been reprimanded by Dmitry Rogozin for saying Russia won’t buy France’s Mistral warships, media reported. The official is said never to have taken part in talks over the ships. Oleg Bochkarev, a deputy chairman of the Commission, was rebuked by his chief, Deputy Prime Minister Dmitry Rogozin, for his announcement on the Mistral ships, Russia's Kommersant newspaper reported. Dmitry Rogozin is in charge of Russia’s space and defense industries and in this capacity he heads several important government commissions. 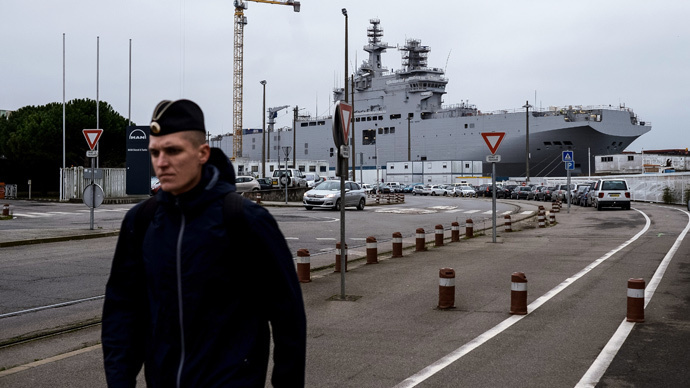 Speaking to journalists on Tuesday, Bochkarev said Russia won’t try and procure the ill-fated Mistral helicopter carriers built for it in France. The only issue now was the amount of money to be paid to Moscow by Paris for breaking the deal, Bochkarev said, adding that French Defense and National Security Secretary General Louis Gautier was expected in Moscow in the near future. Neither of this is true, Kommersant reported, saying Russia hasn’t officially declined to take delivery of the military helicopter carriers. Bochkarev has not even once taken part in any official talks on the matter, the daily reported citing Rogozin. Also, no talks with Gautier were planned for this week. France's official reaction to Bochkarev's statements was restrained, with the representative of the DCNS corporation in charge of Mistrals' construction saying he wasn’t authorized to comment on the issue before official talks begin. Moscow has also not officially commented on Bochkarev's announcement. After the incident, Rogozin instigated special rules for his staff when they talk to the press, Kommersant reported. Russia's Defense Ministry signed a deal with French DCNS to build two warships in 2011. Although the construction of the first helicopter carrier, Vladivostok, is complete, and the second Sevastopol vessel is expected to be ready next month, French President Francois Hollande blocked delivery of the ships to Russia over Moscow’s stance on the Ukraine crisis. Moscow said the Mistral issue has now become purely legal, being ready to accept either the ships or money back. France has reportedly asked for time to think it over until the end of June, when the second vessel will be finished, Kommersant said, citing its sources in the Russian military.